The director that has made Stern TV must have liked our performance, because he later in the year invited us to Berlin for the Presentation of the "DigiGlobe 1999" award for digital achievements. The lucky guy in the entertainment category that year was -AND NOW HOLD ON- the man himself: GEORGE LUCAS. 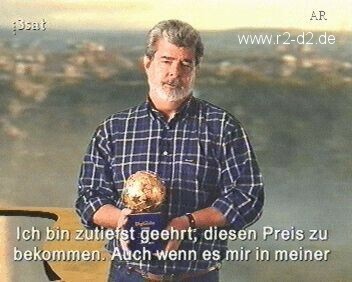 George couldn´t make the visit to Berlin, so - appropriately - he was standing in a greenscreen studio in L.A. for the award ceremony and was projected onto giant screens on stage in Berlin. 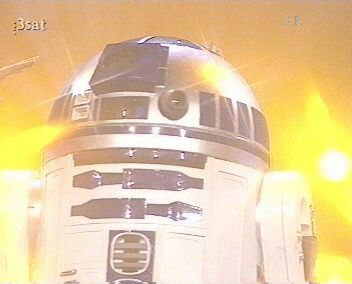 He did then receive his award from a digital copy of my R2-D2, with my R2 providing a seamless link for a live-action presentation on the stage in Berlin. The show was taped on 1st of September, and was shown on TV on the 3rd. Catering rating: *****; there was always a warm buffet available, even at two in the morning after a long day.